Here’s the FITBIT BLAZE.. My goal is to start blogging about how I’m using the Blaze to achieve my fitness goals and also expose problems I’m having with the device as well as my work arounds. I’m recovering from some illness and got deconditioned. They say “the legs are the first things to go” as we age, and that’s something I very strongly believe. I’m planning a mission trip early next year and we expect to do LOTS of walking. Knowing my foibles pretty well, I decided that if I planned to do all my walking in big chunks of 30 to 60 minutes per day (my doctor wants me to do 60 minutes walking daily) that I would likely FAIL. You know how your schedule can get really busy and it’s easy to “skip” an hour long workout. Recently sports physiologists have said that 10 minutes 3 times per day has the same effect as 30 minutes straight. Leonard Schwartz of HeavyHands fame said that in their testing at the University of Pittsburgh cardio improving responses could start coming in as few as 3 minutes. These sources planted a seed in my mind that grew like Jack’s beanstalk the minute I heard my friend describe his new Blaze. He said “It reminds me every hour to do at least 250 steps”. Of course 250 steps hourly won’t “cut it” for my training. I know that I need some much longer blocks of working out daily, but establishing a pattern of activity and daily working out is exactly what I needed to accomplish. As I started reading about how Pritikin’s patients were reversing heart and artery disease I realized all of them – in addition to dieting – were doing huge amounts of walking. That “sealed the deal” for me… I needed to start doing lots more to get my activity in… “mini workouts” along with longer workouts. Consider it a cardio form of “Greasing the Groove”. “Greasing the Groove” or GTG is doing one exercise a lot to become GREAT at it. I figured that’s what had to happen to my walking… though from the outset, I planned to do more than JUST walking. That’s where my knowledge of HeavyHands and Isotonometrics and Pan-X come in. But my FitBit Blaze is proving a big help in its own right. First, it’s helping me track my heart rate… for me knowing I’m in an exercise zone is important when I’m doing heavy hands. But also making sure my heartbeat is returning to it’s resting rate in a timely manner is equally important. The Blaze (while not perfect) is a solid tool to help that. Third, it’s helping me take the stairs and go up inclines. The Blaze makes sure I’m going up flights of stairs daily by tracking the number. Sometimes it’s wacky. I don’t have a single stair in my house but it showed I went up 10 feet while walking around the house this morning. I knew to make up for that over counting later in the day. I like the “badge” I get for hitting 10 “hills” per day. It helps round out my leg development… as do knee bends which the Blaze doesn’t really track except perhaps as steps. Let me tell you, full squats are a challenging way to get steps! Instead, supplement steps and climbing with them! Fourth, it’s tracking overall steps. The “badges” for completing steps are motivating as are the “fireworks” on the watch when hitting your daily goal. By some measures “10,000 steps” is good. Others say that’s rather arbitrary. I know if you’re just doing a couple thousand steps per day, moving to 10,000 is a significant and worthwhile challenge. Staying active every hour, the 10,000 figure wasn’t that hard to reach. Mileage too is tracked so that’s a fifth way the device helps. I was surprised to know I was going over 10,000 steps but not making 5 miles yet. Sixth, tracking “active minutes”. After 1o minutes of exercise the Blaze automatically records your “active minutes” – that’s the figure I’ll be using to determine if I’m doing my 60 minutes per day. Depending on the “expert” you’re following, you need 30 to 90 “active” minutes daily with your heart rate elevated (the higher the elevation the less time required in general) for optimum health. Which number is right? I have no idea. As I mentioned before my doctor wants me doing 60 so I’m working towards that figure. As well as helping us avoid weight gain, activity itself can help to prevent cancer. Studies show that regular activity can help to keep hormone levels healthy, which is important because having high levels of some hormones can increase your cancer risk. Physical activity may also strengthen our immune system, help keep our digestive system healthy and allow us to consume more food and more cancer-protective nutrients – without gaining weight. Research shows that to avoid weight gain, doing more activity is beneficial. High amounts of sitting – sedentary behaviors – also links to overweight and obesity. Moving more throughout the day and limiting sedentary behaviors may help with weight control. For maximum health benefits, scientists recommend that we aim for 60 minutes or more of moderate activity every day, or 30 minutes or more of vigorous activity. Moderate activity is anything that gets your heart beating a bit faster and makes you breathe more deeply – like brisk walking. Vigorous activity means raising your heart rate so that you warm up, start to sweat and feel out of breath. If I’m at work, I’ll just walk or climb stairs probably without arm motions… or sometimes march in place with my hands swinging high. If I’m “working out” at home I’m using HeavyHands, Indian Clubs, Kettlebells, or IsoTonoMetrics. If I’m outside depending on the available equipment I may be using HeavyHands, Nordic Walking Sticks, IsoTonoMetrics, or nothing. Or I’ll “walk and squat” with all the mentioned tools, depending on how I feel. Anyway this is how I’m using the FitBit Blaze to try to maximize the number of workouts through the day and strengthen my whole body… cardiovascular system and muscular system as well. And most of all to make sure “the legs don’t go first”. If you have more questions about the Blaze or integrating it into your workouts, ask questions in the comments and I’ll respond there or respond in another post. PS- you’ll find it very addictive in a positive way to hit all your goals every day and exercise all the hours you’ve chosen! Here’s what that looks like on the FitBit phone app! Glad to see you back and doing better. I believe in speaking with Len, he would agree with doing 10 minute bouts of Panearobic/Longstrength type activity, but, he, I believe would have advocated to do at least one 30 minute or longer session, or build (back) up to that to burn more calories, then add in several few minute to ten minute sessions throughout the day to burn more calories, especially if trying to “lose weight” while building strength/endurance simultaneously is the goal. And I believe he would agree with starting with 2-3 ten minute sessions until you could achieve a full thirty minute continuous session, then as above intersperse several minute to 10 minute additional bouts. Getting to your desired fitness level weight is the hardest part and once you get fit if you remain faithful, it will be easier to maintain that desired level, so starting out slower and building up and making exercise a habit is also the goal. 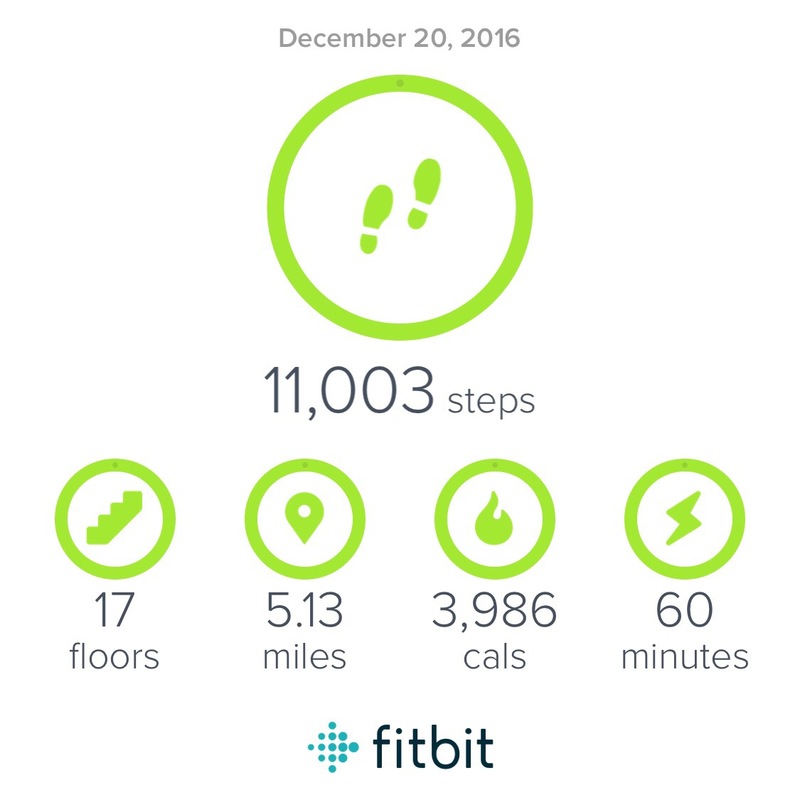 Thanks for sharing how are going to use the Fitbit Blaze to help you achieve your goal. Wishing you the best in Panearobic Adventures!! Yes that’s approximately what I’m doing – lots of short times and some longer ones. Thanks John. P.S. : A very Merry Christmas to you and yours!! !